Really Reasonable Ribbon Blog: RRR September Blog Hop Winner! This is the second post of the day. Be sure to scroll down to see the beautiful project that Teresa has made for us today. I asked what your favorite Halloween candy is. We it seems like candy corn won hands down. I really don't get it because I really feel like it has no flavor at all......lol. I'm a chocolate girl though, so that might be why. Well, candy corn time is here girls, so enjoy!! 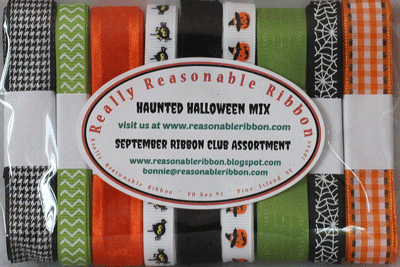 Now, on to our winner who will receive the September Ribbon Club Assortment from Really Reasonable Ribbon. The winner will have 48 hours to contact me by clicking on the contact button at the top of the blog and sending me your full name and shipping address. So many favorites!!! Reese's Peanut Butter cups, Butterfingers, Snickers and Smarties (tart American kind).